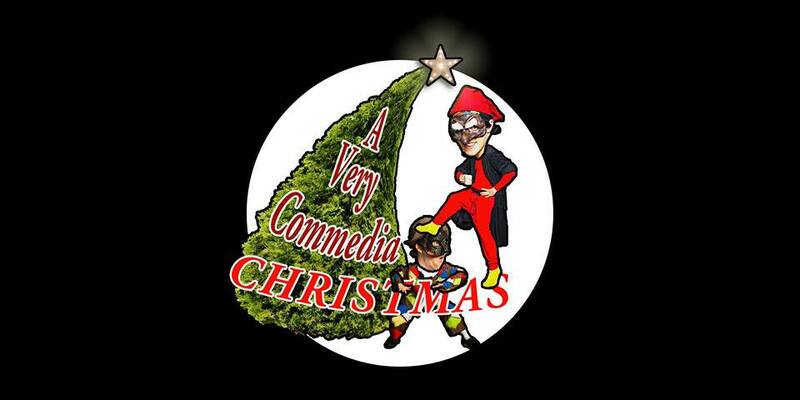 A Very Commedia Christmas by Lightning Theatre December 2015 in Victoria BC. A review. You are here: Home / Arts / A Very Commedia Christmas by Lightning Theatre December 2015 in Victoria BC. A review. Mining a centuries-old theatrical tradition, one on which much of modern improvisation, comedy and drama is based, and re-inventing it, while making it relevant for today’s young, hip and culturally obsessed generation, is a massive undertaking requiring perspicacity, diligence and practice. Originally founded as an improv troupe with a twist in 2013, basing their work on classic Commedia Dell’Arte characters and techniques, the actors of Lightning Theatre have honed their craft with a number of improvised shows in the intimate space of Intrepid Theatre Studio (An Improvised Commedia Dell’Arte Scenario) and on the larger Metro Studio stage during the Victoria Fringe (Mask Over Matter-2014, An Improvised Tragedy-2015). They also created several improvisations based on games (The Resistance: Improvised and Werewolf). Earlier in the year, company founder Kevin Koch, while still enamoured of Commedia, felt he had accomplished his goals and was ready to move on, when he had a discussion with fellow improviser Andrew Brimmell. The happy result is a scripted take on the scenarios, set at Christmas with references to Ebenezer Scrooge, the Marx Brothers and Citizen Kane (there will be no spoilers!). Most audiences are unaware that the character of Ebenezer Scrooge is, in fact, based on the miser Pantalone. Brimmell captures his crotchety, rapacious nature and old man posture to perfection as he schemes and plans to defraud his Christmas party guests with his dim-witted servant Arlecchino (Byron Kjeldsen). A visit from an old friend, Il Dottore (Kevin Koch) threatens to up-end their brilliantly contrived robbery but in the end, evil triumphs. Vulgar humour (quite in keeping with commedia convention) and implausible situations are liberally sprinkled throughout—the farcical nature of the comedy is highlighted through great gestural physicality. The action takes a brilliantly devious turn when the three ghosts arrive to teach Pantalone a lesson through flashbacks incorporating an incredibly sad and down-trodden Piccolo Pedro (Kevin Koch) and his father (Shahin Sanjari), a workman recently fired by Pantalone. A working knowledge of Citizen Kane will help audience members derive the most benefit from the elaborate plot but is not absolutely necessary. The famous Hallway of Mirrors sequence in re-interpreted to great effect. Other memorable moments include the Arlecchino rap recounting how he came to work with Pantalone. Emma Dickerson’s skill on sound and lights leads to many “aha” moments. Iconic musical themes synonymous with holiday celebrations (Dance of the Sugar Plum Fairies) are juxtaposed with grittier moments while In the Cruel Mid-Winter was particularly appropriate. A Very Commedia Christmas is complex theatre that pushes the genre of slapstick into new pop-culture realms and fairly begs to be seen more than once to capture all the innuendo, situational humour and references. Now the question is—what will Lightning Theatre get up to in 2016? More information about Commedia Dell’Arte can be found on Lightning Theatre’s website. A Very Commedia Christmas December 10-12, 2015. Interview with Kevin Koch of Lightning Theatre. The Improvised Tragedy by Lightning Theatre at the Victoria Fringe 2015. Preview. A Christmas Carol at the Belfry Theatre December 1-20, 2015. A review. Lethal Christmas by Paper Street Theatre December 16-19, 2015. An interview. Spit Delaney’s Island at Theatre Inconnu December 3-19, 2015. A review.